A tetromino is a figure made of four squares joined edge to edge. A pentomino is a figure made of five squares joined edge to edge. There are 5 tetrominoes and 12 pentominoes, not distinguishing reflections and rotations. They were first enumerated and studied by Solomon Golomb. Here I show minimal known tetromino-pentomino compatibility figures, allowing or disallowing holes. If you find a smaller solution or solve an unsolved case, please let me know. The largest solution, for the square tetromino and the T pentomino, was found by Helmut Postl. For compatibility of two pentominoes with or without holes, see Pentomino Compatibility. Resta's page of tetromino-pentomino compatibilities was originally on GeoCities, a defunct web host. It is now here. Mireles's site was also on GeoCities and has not been rebuilt. The link above is to the Internet Archive. This table shows the smallest number of tiles known to suffice to construct a figure tilable by the tetromino and the pentomino. 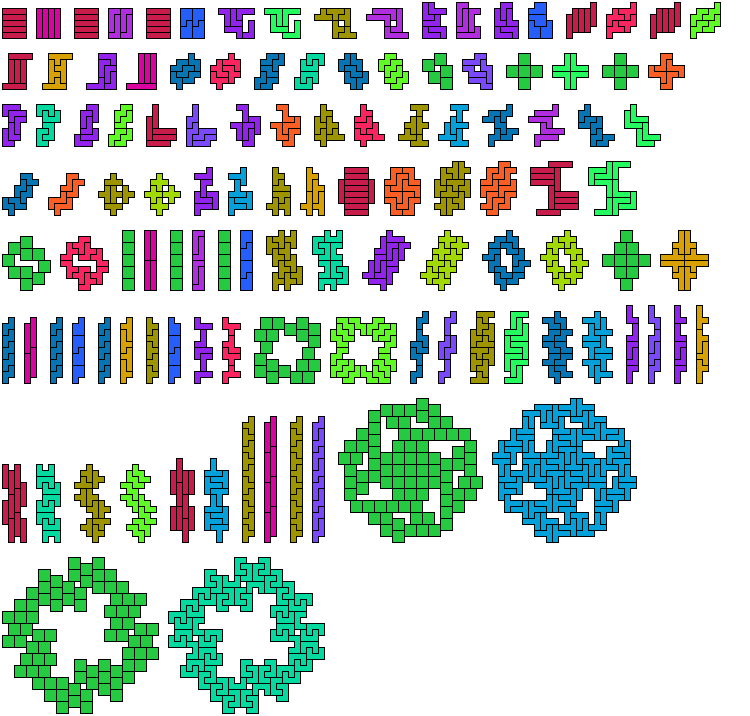 This table shows the smallest number of tiles known to suffice to construct a holeless figure tilable by the tetromino and the pentomino. Shaded cells indicate solutions that are minimal even if holes are allowed. Here I show only solutions that are larger than the corresponding minimal solutions allowing holes. So far as I know, these solutions are minimal. They are not necessarily uniquely minimal.